According to a sixteenth-century Japanese commentary on the Lotus Sutra, the venerable Chinsô Kashô was once preaching on the “ten wickednesses of women” when an angry old nun stepped out from the audience and shouted, “It’s not just women who are so evil—you’ve got plenty of wickedness in you, too!” Women were reviled in much of the popular Buddhist rhetoric of medieval Japan, castigated for their “filthy femininity,” but their low spiritual status was in fact frequently contested. This dispute over the place of women in Buddhism was often played out in the realm of medieval preachers’ and storytellers’ apocryphal tales of the lives, deaths, and inevitable religious awakenings of prominent female literary figures of an earlier age. 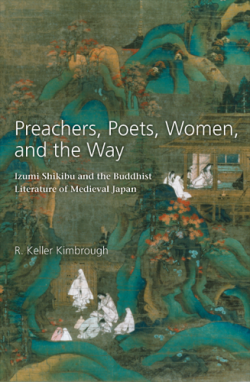 Inspired by the folklorist Yanagita Kunio’s groundbreaking work of the early 1930s, Preachers, Poets, Women, and the Way explores the ways in which such fictional and usually scandalous stories of the Heian women authors Izumi Shikibu, Ono no Komachi, Murasaki Shikibu, and Sei Shônagon were employed in the competitive preaching and fund-raising of late-Heian and medieval Japan. The book draws upon a broad range of medieval textual and pictorial sources to describe the diverse and heretofore little-studied roles of itinerant and temple-based preacher-entertainers in the formation and dissemination of medieval literary culture. By plumbing the medieval roots of Heian women poets’ contemporary fame, Preachers, Poets, Women, and the Way illuminates a forgotten world of doctrinal and institutional rivalry, sectarian struggle, and passionately articulated belief, revealing the processes by which Izumi Shikibu and her peers came to be celebrated as the national cultural icons that they are today.